You probably know by now that I love leftovers. I think of them as a game–a challenge and a springboard to make something new. I also love things that will use up bits and pieces of leftover ingredients; a place to put things that will otherwise rot and waste away in the fridge. Herbs have to be amongst the most egregious offenders. You buy a few because you need a few sprigs of parsley or thyme for some dish, and you wind up with an entire bunch wilting away in the fridge. Greens and microgreens are often the same way. I love the sauces in this post because I just throw a bunch of stuff in a blender and out comes something delicious–that’s the case with the pesto, salsa verde, and the chimichurri at least. They’re all bonus items that essentially come out of what might have wound up in the trash. I've quickly included gremolata in the post too, because while it doesn't get blended, it does make use of extra items. Since I’ve started making them, these sauces have nearly become Building Block items in our house because I almost have one or two of them around. Once they are around I start using them with everything. They’re super handy condiments to dress up a million dishes and make them seem fancy, or just to throw in eggs, sandwiches, or burritos. Now, I know purists and traditionalists will say that some of these sauces would be better made in a mortar and pestle. Fine, that might be true, but let’s be real–who has the time? Plus, I’m trying to use things up, not give myself (more) giant time consuming projects and a case of carpal tunnel. (Ok, I already have carpal tunnel–no need to make it worse.) These all only take a few minutes each. I also treat them as non-recipes. There are guidelines here, but generally I just throw things in the blender, taste, tweak, and adjust until they taste right. The three blender sauces tend to turn out pretty large batches, however, they also all freeze really well. Everyone loves pesto, right? It’s creamy, it’s herby, and a little bit nutty. Yum. Sure, you can definitely buy it, but it’s also so easy to make your own–especially if you happen to have the components hanging around. 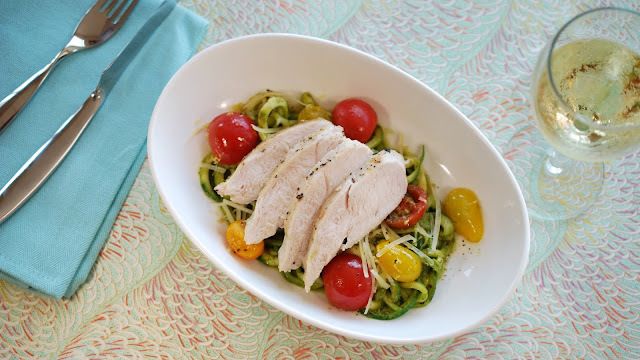 I recently wrote up a version for a recent 8 & $20: Chicken Breasts with Pesto Zoodles. Here’s the sauce portion broken out. Place the basil, garlic, ½ cup Parmesan cheese, pine nuts, and a generous pinch of salt in a blender or food processor. Run the blender and gradually begin to add the olive oil in a steady stream while the blender is running. Occasionally stop the blender to scrape down sides with a rubber spatula, and blend until smooth. Taste and adjust seasoning as needed. Optional: I also like to add a little squeeze of lemon juice for acidity. This version has quantities included, but like I said, feel free to go by taste. Also, feel free to play around with the ingredients. Try different hard cheeses. Walnuts are used in a lot of traditional versions (Ina Garten splits the quantity of nut between pignolis and walnuts in her version.) Pecans can also give a nice warming note. In all of these cases, I think using the toasted/roasted versions of the nuts (or toasting them yourself) gives extra depth of flavor. Arugula and kale (or even kale stalks) are also really good in pesto. If you buy carrots at the farmer’s market and you don’t know what to do with all the leafy tops . . . well, pesto is your answer. It’s a good idea to quickly blanch them in boiling water, though; otherwise they can be a little bit bitter. Ok, this one isn’t mine–it’s from Tartine Bakery & Cafe. They make their Spicy Turkey Hot Pressed sandwich with turkey, provolone, and a pesto made from broccoli rabe. Here are a few more ideas on how to use, beside on pasta . . . which is pretty damn tasty too. Use it to top a a Strata or Frittata. Greek yogurt or sour cream and toss with chicken or other proteins. Makes a great wrap too. Drop a spoonful or two in a bowl of soup to boost the flavor. Here I crossed a soup 'au pistou' with a tortellini in brodo. Use it as a dipping sauce for arancini and other apps. Salsa Verde with stuffed calamari. This recipe is up on SommsTable.com. Photo credit: Greg Hudson. Salsa verde translates simply to "green sauce," and you 'll find examples in Italian and Latin America cuisines. I started making this sauce thanks to an obsession with Jonathan Waxman’s famous Roast Chicken with Salsa Verde and Roasted Lemons. This chicken has been on the menu at several of his restaurants and has been written up many times. Greg and I fell in love with it at his restaurant Barbuto in New York. When I looked up the recipe, it occurred to me that it would be a great way to use up herbs and greens. Salsa Verde on Jonathan Waxman's famous roasted chicken. It'll look a little different if you make it with a blender. 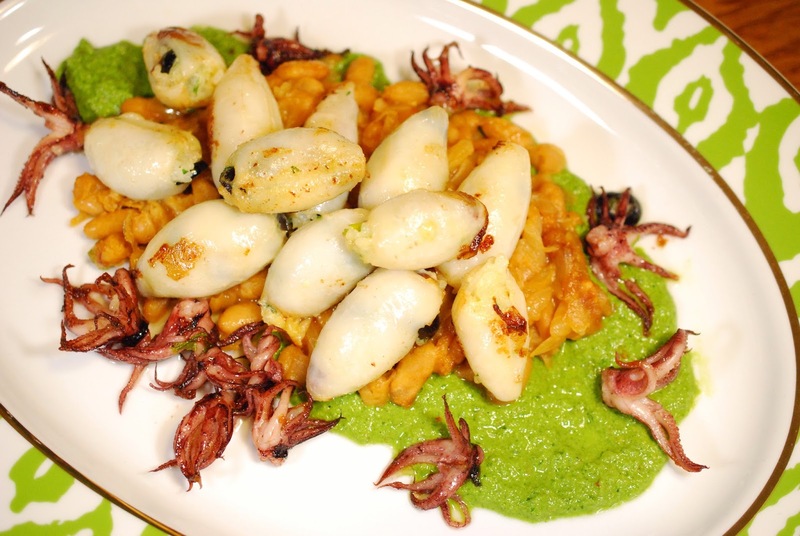 In a mortar or blender, mash the capers with the anchovies and garlic until a paste forms. Transfer to a medium bowl and whisk in the 1 cup of olive oil. Stir in the herbs; season with salt. I do always use the capers, garlic, and anchovies, but nowadays, I just throw in whatever herbs and greens are on hand and I add oil until I like the texture and flavor. In addition, I like to add a little lemon juice or white wine vinegar, which gives it a bit of brightness and I suspect it also helps to preserve the mixture longer. If the flavor comes out tasting a little bitter, add a teaspoon of sugar or two to help balance it out. The texture does turn out different in the blender from his version, but like I said, I’m trying to keep it as easy as possible. I use this sooooooo many different ways. For example, I recently used this both as a marinade and rub for a porchetta, and then served it as a condiment with dinner. I love it on eggs– in this post, I used it to top this leftover makeover omelette. Chimichurri used on the side of Sous Vide Coffee-Spiced Pork Tenderloin with Wild Rice and Red Cabbage Slaw based on recipe from Lisa Q. Fetterman's Sous Vide at Home. Chimichurri is typical of the cuisine of Argentina, although it’s also common elsewhere in South America. It is really similar to salsa verde, and it’s usually based on parsley, cilantro, and/or oregano. It also will have red pepper flakes instead of the capers and anchovies. I’ve seen versions with chiles or tomatillos, and there are red versions with tomatoes and red red peppers. Shallots and onions are also common additions. Here is one traditional version. Put in a blender and run until saucy. Taste and adjust seasoning and add more lemon juice if needed. Add more oil if it’s too thick. Tip: Same as with the salsa verde above, add a little sugar if the sauce is too sour or bitter. This is a helpful trick for adjusting the flavor of sauces in general. Given that there are so many variations, I see no need to be faithful to any particular recipe. You can use this in all the same ways as the salsa verde. It's a little hard to see here, but I recently served chimichurri as an accompaniment to Pabellón for a recent Shalon dinner. This is a dinner and discussion series I've been working on with a friend here in the Bay Area. If you're in the region, please come join us sometime. I really do you use chimichurri and salsa verde pretty interchangeably. Recently, I've had batches of both hanging around, so not even 100% sure in some cases of which one I used in the photo. Here are a couple more ideas for using either. I often also just dollop them on salads. Here is one use on a roasted root veggie salad with baked goat cheese and pork. All of the cases in the post are from just the last few months, that how much we use them. Ok, this one doesn’t even need a blender. It’s just chopped garlic, lemon zest, and parsley. This is a good one to make when you have a bunch of lemons around–use that zest and get a little something extra. It’s great on most proteins. The only downside is that doesn’t keep all that long.